Pierrot lived in Paris with his parents until he was orphaned. He spends some time in an orphanage until he is taken in by his aunt Beatrix whom he has never met. She is a servant in a fancy house in Germany. One of the first things she does is change Pierrot's name to its German variation, Pieter, explaining that it will be better if he has a more German name. She also advises Pieter to not mention his childhood friend Ansel who is Jewish. When the master of the house finally arrives it is none other than Adolph Hitler. Pieter is impressed with Hitler and tries to do whatever he can to impress the man. 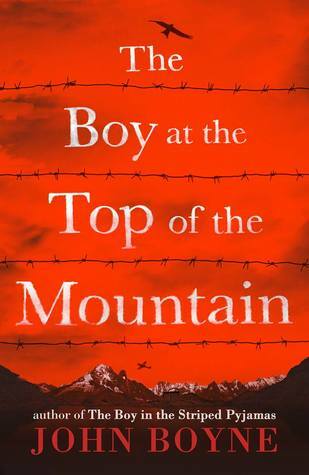 Hitler takes Pieter under his wing and begins turning him into a perfect German boy. I've never actually read The Boy in the Striped Pajamas because it is always checked out of my library and I never have to work to sell it to my students so I have no comparison to Boyne's earlier works for this book. However, I was absorbed in this book. I don't believe it is the best writing ever and the story is not always nuanced, but that is not what I took away from the book. As he falls more under Hitler's spell, Pieter begins spouting Nazi propaganda and acting as a good Aryan boy ought to act. He finally does something unforgivable and shocking to me as a reader but it is exactly what many Germans did during Hitler's reign. Later in the book, Pieter begins to realize that his actions have been horrible and he tries to make amends but Boyne makes it clear that although you can apologize and try to make up for your past actions, you will always have to live with what you have done. That is a lesson I think is very important to take away from the story. I also liked the slow assimilation of Pieter to the Nazi mindset. All too often we ask how can people do some of the horrible things they do? Why didn't the Germans stand up to the Nazis? Why would people follow the teachings of the Taliban? People can be indoctrinated slowly, in steps so small you can't even see the path until you are at then end of it. That's the strength of this book. Pierrot is a nice boy, a kind boy. But even he can be molded into someone else with the right attention and messages.